Saltum cottages are top notch along with some of the best beaches in Denmark. With a cottage in Saltum Strand you will have a Danish North-Sea vacation at its full. Fårup Sommerland, Skagen and Heden are but a few excursion spots open to you in a cottage in Saltum. Experience shows that cottages in Saltum is a recurring event. There was no summer houses in Saltum Strand - In stead we shows summer houses in the neighbour villages to Saltum Strand. Cottage near the beach with ample space for 6 people. 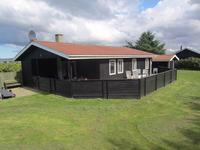 Well-kept and well-arranged cottage with 3 bedrooms, 2 bathrooms and spa bath. Fine terrace well protected from wind. 7-minute walk to the beach and 10-minute walk to downtown Løkken. 6 persons 3 bedrooms Dishwasher Washing machine Whirlpool Sauna Woodburner Distance to beach: 400 m.